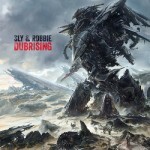 After Underwater Dub and Dubmaster Voyage comes Sly & Robbie’s third dub album this year. It’s titled Dubrising and is mixed by Paul “Groucho” Smykle, who is probably best known for Black Uhuru’s The Dub Factor, released in 1983. In a press release the album is described as “taking you back to the golden age of dub” and being “heavy as lead, yet musical and refined”. And just as Dubmaster Voyage it features dub versions of tracks by Bunny Rugs, Horace Andy and Chezidek, among a few more. Dubrising drops in November and will initially only be available on vinyl. In addition to the 33 RPM edition, a limited audiophile version will be available on a double 45RPM 12″ pressed on heavy 180g vinyl.